Announcement All Items in my shop today are READY TO SHIP! Happy Shopping! Custom Embroidery & Personalization •._.• Every item Handmade By Me (Jul) ~ EMBROIDERED Items stitched with Designs for Every Occasion! Wearable, Functional & Beautiful Art. Clothing, Aprons, Totes & Bags, Blankets, Baby Items, Towels and more. Custom Embroidery available. Almost every design can be stitched on any item. Just ask! It's my business to take it personally! Make a personal gift for someone today. 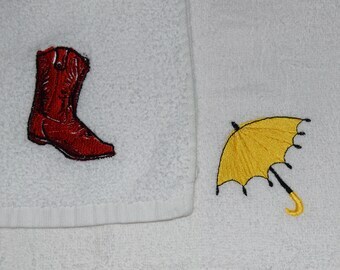 Embroidered Items are Sewn directly onto your item. Your name, team name, numbers and dates or a design can be embroidered on clothing, towels, blankets and more. Great quality work and fabric with a design that won't wash away! These items are sewn with thread, not painted on. They won't wear off! Come and see the many items offered! I will ship worldwide. I do my best to calculate shipping and handling. Etsy charges a percentage on shipping which has been added to the shipping fees. Etsy takes that money before I receive your payment. Thank you for your understanding. Many items in my shop are made AFTER you order them. These CUSTOM orders take time. Please be available via Etsy Convo to approve the mock-up, if necessary. Please allow time for the mock-up and approval of your design and then, approximately 2-3 weeks for your Custom order to be made and then to arrive. (I can often stitch it sooner, if I have the item to stitch in stock.) I try my best to get you your item in 2 weeks, but it does depend on the speediness of your mock-up approval, and then, pending the mail service. If there is time and availability, I do offer Rush Service. Just ask before purchasing. Thank you for your understanding. Custom designs may be possible, but will take more time and cost an additional fee. Thank you. * I understand the EU has new laws regarding shipping fees. In the US, we do not reimburse shipping fees for customs delays or with returns. The return shipping is also the responsibility of the buyer. Any shipping fees will not be reimbursed. If you have any problems with not being reimbursed shipping fees, please do not purchase. Thank you for your understanding. *Also, Jul's Sew Crazy is not responsible for any customs fees you may incur. All customs fees and international fees are the responsibility of the buyer. Thank you. All Items in my shop today are READY TO SHIP! Happy Shopping! I had a Boo Boo Bunny as a kid so I had to have one for my daughter. This is absolutely perfect! She loves it and it works magic for boo boos! OMG! These are absolutely adorable. 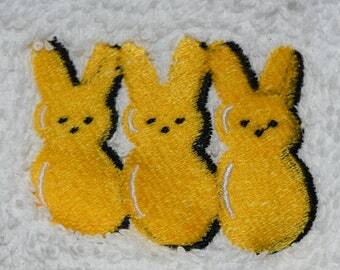 The stitching is beautiful and the little cotton tail is such a cute finishing touch. Came so quickly. Enjoying the road trip in the car. Custom Designs for schools, teams, brides, any group or club! Energy ~ Digitized & stitched by me to "look" like paint brush strokes, but created from thread. Bride and Groom Beach Towels Custom made! The perfect gift for a wonderful couple! I must be SEW CRAZY! I have been creating and sewing crafted items all my life. My friends always received handmade gifts for Christmas and birthdays. It was only natural that I started selling at Craft and Holiday Fairs. I began selling at Art and Wine Festivals. My craft business concentrated on the summer months, as I have taught elementary school since 1989. When I gave birth to my 4th child, almost 80% of my paycheck from teaching went to Day Care. It was crazy. My husband and I talked about it and calculated the opportunity. I took a leave of absence from my teaching job for a few years to raise our kids. I have returned to teaching full-time, but still work my Etsy shop full-time. And I am a full-time mom. My cup runneth over with good things. I have the best of all three worlds, Family, Outside Job and my Home-based Job. It's a balancing act, and I am so happy. Mother of 4 wonderful children. Elementary School Teacher. Artist and Embroiderer, Crafter. Family First and everything else will fall into place with faith, love and hard work. It's my business to take it personally. I want to make it PERSONAL! And I want you to be happy with your purchase. Only top quality products and brand names are stitched in my shop. "Mock-ups" of personalized items are sent for approval before stitching when there is any deviation from the photo in the listing. Once approved, these items cannot be returned unless there is a defect in the product. I will gladly replace any item that is damaged. Due to the nature of my items, I will not be able to accept returns on personalized items, unless there is a flaw in the product. I hope you can understand the reasoning for this policy. I do want you to be happy with your item. Understanding this policy will help in our communication and feedback with each other. It is my goal to send you the best quality product that you pre-approve with your purchase of the listing and approval of the "mock-ups". For clearance, sale items and "DEAL of the DAY", ALL SALES ARE FINAL. Each item is described to the best of my ability and knowledge. For "non-custom or non-personalized items," please contact me if you need to return your item. I only need to know that your will be returning the item so that I can look for it in the mail. Return shipping to be paid by the buyer. Shipping fees will not be refunded as the USPS takes that money and does not refund me to give back to you. Beyond that, please let me know if there is anything I can do. Visa, MasterCard, Discover, and American Express are accepted through the Etsy Checkout. Paypal is also accepted. California residents, current sales tax will be added. Uncle Sam wants his share. Shipping is done through the US Post Office. I have looked for the most inexpensive way to send your items, USPS, UPS, FedEx, in a timely fashion. US mail tends to be the best. Standard parcel post and First Class Mail are used unless specified in the listing. "If you are purchasing from out of the United States, please be aware of your country's customs taxes, should there be any. Jul's Sew Crazy is not responsible for any additional fees charged by customs or any other governing body from your country." Please note: Second shipping price is in addition to the first price "when shipped with the first item to the same address". Thank you. Each item is made one at a time by me in my smoke-free, pet-free home. We have allergies in my home, so I understand the need for the "free zone". As each item is made one at a time, I have listed the best price possible to everyone. I do my best to get your items to you quickly, and quality work takes time to make. Thank you for your time and understanding. I will get your product to you as quickly as possible. If you have a due date, please let me know before purchasing so that I can confirm that I can meet your needed date without delay. Thank you!